SARASOTA — Golf courses today speckle the state, expertly cut out of just about every possible Florida terrain one could imagine, but did you know one of the first courses in the U.S. was located right here in Sarasota? Built in 1886 on a 110-acre tract bordering Main Street, the nine-hole course was the start of golf in Florida, and the U.S., as we know it. Whatever the case, it was definitely a Scot who first brought the game here. John Hamilton Gillespie, who was elected first mayor of the Town of Sarasota in 1902, is credited with building the first golf course in the U.S., according to the State Archives of Florida. Back in the late 1800s, when Sarasota was just beginning to take shape, Gillespie had a crazy pipe dream that included the course, a clubhouse and a five-star hotel. Lucky for us, the dream actually came to fruition in 1905. Gillespie was an aristocrat and the son of a man by the same name except J.G. Senior sported the title “Sir,” an honor conferred by royalty. Both Gillespies were lawyers as well as members of the Royal Company of Archers, an organization that served as bodyguard for the queen. However, in 1885, John Gillespie Junior was one of several Scottish immigrants who boarded a steamer departing Glasgow, Scotland that was bound for Sarasota. They were promised a trip to a new land filled with, well, promise. What they found when they arrived was a freezing barren landscape with no crops, no housing and no dock for the boat to pull up to! So why were these immigrants duped into crossing an ocean for a budding town not quite ready for habitation? According to historian Janet Snyder Matthews, it was all part of broadside settlement enacted to help some wealthy politicians get out of debt after the Civil War. 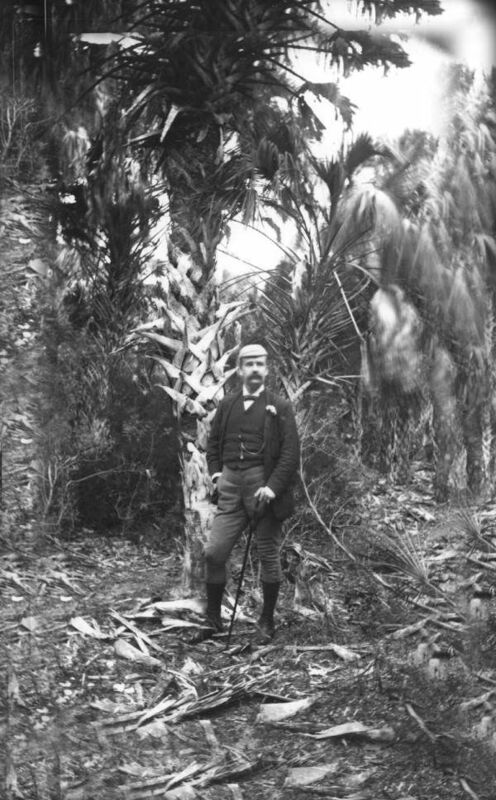 In 1881, Governor William Bloxham crafted an agreement with former Union officer Hamilton Disston, basically allowing him to drain the Kissimmee River Valley, south of Lake Okeechobee, in order to provide millions of acres of fertile soil for grazing cattle and farmland. Disston of course would get half of the acreage. He ended up paying $1 million for four million acres; talk about a good investment! Disston sold half his land to Edward J. Reed, an international land developer from England. Towns soon popped up across the state donning English and Scottish names. Those Scottish immigrant families boarded a steamer bound for a place the clever land developers designated “Ormiston Colony,” a rebranded version of Sarasota, itself a modern version of its former Spanish name Zarazote. The colony was described as a brand new town with profitable citrus groves and vegetable fields that grew during the winter, a luxury Scotland did not provide. Imagine the surprise when the weary travelers had to wade ashore only to find they needed to build their own shelter out of something called ‘palm fronds’ or stay with a family they didn’t know. When snow began falling the next month, most of the Scots packed their belongings and headed back home. You can read more about their experience here. But young Gillespie stayed. He smelled potential. Gillespie was considered a construction manager of the undertaking. In 1886, he cleared woods along Main Street and laid out a long fairway. By 1905, he had completed a nine-hole course and clubhouse on the 110-acre tract. At the time, golf was just emerging in the U.S. Although the Savannah Golf Club can be traced back to 1794, the majority of clubs opened in the late 1800s, with the first official U.S. Amateur Champion taking place in 1895. Probably inspired by his own disappointing arrival, Gillespie also built the Desoto Hotel, which he placed at the foot of Main Street to serve as accommodations for those visitors and investors arriving by ship.